Courtesy of Keiichi Nakayama, M.D., Ph.D.
a, List of detected phenotypes with Chd8 heterozygous mutation in mice. Both Chd8 mutant strains (RBRC09758 and RBRC09759) show similar symptoms found in ASD patients with Chd8 mutation. b, Gene set enrichment analysis (GSEA) plot of down-regulated genes with ASD. GSEA revealed that genes in which expression is down-regulated in the brain of ASD patients tended to show a similar expression pattern in the brain of Chd8 heterozygous mutant mice. Autism spectrum disorder (ASD) is a highly prevalent neurodevelopmental disorder. ASD is characterized by difficulties in social communication and social interaction, and by restricted and repetitive patterns of behavior. ASD pathogenic mechanism is suggested to be closely related to genetic factors. Recent exosome sequence analysis for ASD patients revealed many de novo mutations, with chromatin helicase DNA-binding protein 8 (Chd8) being the most frequent mutation site (1, 2, 3). Chd8 is a remarkable gene for ASD research. CHD8 is expressed not only in neuronal tissues but also in many other tissues and functions as an ATP-dependent chromatin remodeling factor in regulation of many gene expression. Chd8 transcripts two alternative splice variants that encode a full-length CHD8L and a short-length CHD8S. Depositors (Dr. Nakayama) and his colleague developed two independent Chd8 knockout mouse which deficient in both CHD8 isoforms (ΔSL: RBRC09758) and only CHD8L (ΔL: RBRC09759) (4). Both heterozygous mutant strains show ASD-like phenotypes, similar to findings with ASD patients. 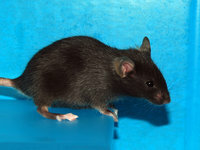 For example, Chd8 mutant mice show characteristic behaviors such as increased anxiety, repetitive behaviors and abnormal social interaction. Chd8 mutant mice also show macrocephaly and gastrointestinal defects, consistent with ASD patients with Chd8 mutations (5). Moreover, gene expression pattern in Chd8 mutant mouse brain is similar with that in ASD patient’s brain. Thus, CHD8 haploinsufficient mutant mice is a highly reproducible models of ASD. 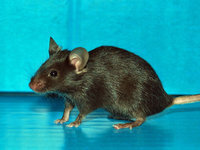 Chd8 mutant mice may be useful not only for pathogenic study but also for drug or therapeutic development. Depositor : Keiichi Nakayama, M.D., Ph.D.
References :  O’Roak BJ, Vives L, Girirajan S, Karakoc E, Krumm N, Coe BP, Levy R, Ko A, Lee C, Smith JD, Turner EH, Stanaway IB, Vernot B, Malig M, Baker C, Reilly B, Akey JM, Borenstein E, Rieder MJ, Nickerson DA, Bernier R, Shendure J, Eichler EE. Sporadic autism exomes reveal a highly interconnected protein network of de novo mutations.Nature. ; 485(7397): 246-250, 2012. Talkowski ME, Rosenfeld JA, Blumenthal I, Pillalamarri V, Chiang C, Heilbut A, Ernst C, Hanscom C, Rossin E, Lindgren AM, Pereira S, Ruderfer D, Kirby A, Ripke S, Harris DJ, Lee JH, Ha K, Kim HG, Solomon BD, Gropman AL, Lucente D, Sims K, Ohsumi TK, Borowsky ML, Loranger S, Quade B, Lage K, Miles J, Wu BL, Shen Y, Neale B, Shaffer LG, Daly MJ, Morton CC, Gusella JF. Sequencing chromosomal abnormalities reveals neurodevelopmental loci that confer risk across diagnostic boundaries.Cell. ; 149(3): 525-537, 2012. Neale BM, Kou Y, Liu L, Ma’ayan A, Samocha KE, Sabo A, Lin CF, Stevens C, Wang LS, Makarov V, Polak P, Yoon S, Maguire J, Crawford EL, Campbell NG, Geller ET, Valladares O, Schafer C, Liu H, Zhao T, Cai G, Lihm J, Dannenfelser R, Jabado O, Peralta Z, Nagaswamy U, Muzny D, Reid JG, Newsham I, Wu Y, Lewis L, Han Y, Voight BF, Lim E, Rossin E, Kirby A, Flannick J, Fromer M, Shakir K, Fennell T, Garimella K, Banks E, Poplin R, Gabriel S, DePristo M, Wimbish JR, Boone BE, Levy SE, Betancur C, Sunyaev S, Boerwinkle E, Buxbaum JD, Cook EH Jr, Devlin B, Gibbs RA, Roeder K, Schellenberg GD, Sutcliffe JS, Daly MJ. Patterns and rates of exonic de novo mutations in autism spectrum disorders.Nature. ; 485(7397): 242-245, 2012. Katayama Y, Nishiyama M, Shoji H, Ohkawa Y, Kawamura A, Sato T, Suyama M, Takumi T, Miyakawa T, Nakayama KI. CHD8 haploinsufficiency results in autistic-like phenotypes in mice.Nature. ; 537(7622): 675-679, 2016. Bernier R, Golzio C, Xiong B, Stessman HA, Coe BP, Penn O, Witherspoon K, Gerdts J, Baker C, Vulto-van Silfhout AT, Schuurs-Hoeijmakers JH, Fichera M, Bosco P, Buono S, Alberti A, Failla P, Peeters H, Steyaert J, Vissers LELM, Francescatto L, Mefford HC, Rosenfeld JA, Bakken T, O’Roak BJ, Pawlus M, Moon R, Shendure J, Amaral DG, Lein E, Rankin J, Romano C, de Vries BBA, Katsanis N, Eichler EE. Disruptive CHD8 mutations define a subtype of autism early in development.Cell. ; 158(2): 263-276, 2014. All materials contained on this site may not be reproduced, distributed, displayed, published or broadcast without the prior permission of the owner of that content.